Unlimited on-line Dr. visits for your whole family. 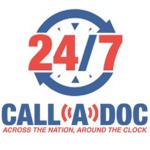 24/7 Call-A-Doc physicians are dedicated to using technology to help bring health care to people that need it, when they need it. They will give you the time and attention you deserve to recommend or prescribe a treatment plan. The 24/7 Call-A-Doc care team will follow up to make the treatment plan meets your needs.